This client rang me up, said wanted to pass me photos. He ordered 2 caricatures in colour with theme, and 1 portrait in colour pencil. 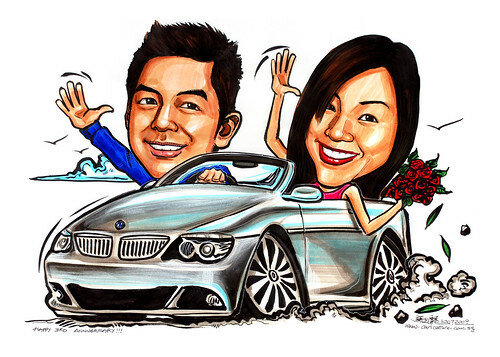 His brief for this caricature is to have him and her girlfriend in a sports car, as a third anniversary gift for the latter. I chose a BMW 650i. Why? Nothing specific, but it looks good on my iPhone, when I googled it online. :D Unfortunately, I don't have that type of gray colour in my colour markers collection. Added in some pastel white to smoothen the colours out, and lighten the colours. NOt very ideal, though, in terms of colour.